Lowell Fillmore (1882-1975) was the oldest son of Charles and Myrtle Fillmore, co-founders of Unity. His work in the movement began at age 8 when he worked in the family printing business after school and continued for 75 years. He ran the early printing press, served as manager of the ordering department, was editor of Weekly Unity, and wrote a Things Remembered be Remembered column. He was general manager of Unity School for five decades and became president of Unity in 1948 (when his father died), serving in that capacity until 1972. Then he served on the Board of Directors until his death at age 94. 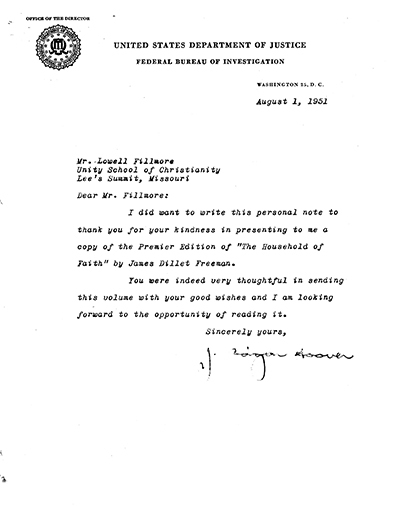 Here is an example of why it is so fun to visit the Unity Archives ... to the right is a letter from J. Edgar Hoover to Lowell Fillmore, where the FBI Director thanks Lowell for sending him a copy of The Household of Faith. Click on the image to open/download a PDF of the letter. Neal Vahle. Open View Press, 2014. This book reveals for the first time the key role played by Lowell Fillmore in the development of the Unity Movement. It was Lowell whose wisdom, executive capability and creativity, almost single-handedly enabled Unity to achieve amazing growth. This is a must read for anyone interested in how Unity came to play an important role in the development of world religion. Rev. Phillip Pierson, former vice president, Unity School of Christianity and co-host of the popular “The Best Is Yet to Be” television ministry.